Owing to our immense industry knowledge, we are engaged in manufacturing and exporting Oil Hydraulic Baling Press. At per with industry specific guidelines, these bailing presses are manufactured by our talented professional using cutting-edge technology. Highly demanded by paper industries, these bailing presses are suitable for bailing waste paper, rolling paper cuts, corrugated paper broke and white & colour paper broke. 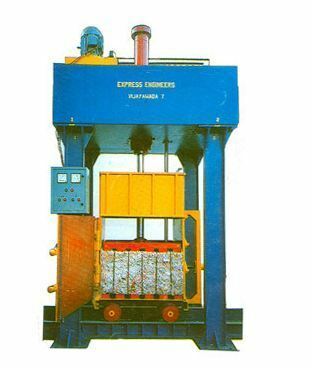 Before supplying, Hydraulic Baling Press is duly checked by us on various quality norms. Ours is a leading and successful manufacturing company started in 1983 with a strong determination of balancing both quality and customer satisfaction on both sides simultaneously. We could achieve many awards and rewards in our journey by maintaining our uncompromised standards and determination and also by the co-operation of our buyers. Our success has given some fruits to our journey like getting Awards starting from National level to State and local level. These rewards gave us more fuel to sharpen our abilities and new ideas to bring new kind of products for the first time in india. We proudly announce that we are the first manufacturers of some of the products like "Oil hydraulic cotton baling press" for which we got national award , "Oil hydraulic Jute bag baling presses", "Mobile hydraulic press" for which we got state awards, "Automatic Sugarcane bagasse hydraulic press", "Hydraulic paper plate press". We continue our research and development for innovating more new products. Our service to our customers bring them to us directly when they get second time requirement also and make them suggest to others. We always dedicate ourselves for meeting the customer requirements and satisfaction levels.